In the previous posts in this series we explored the economics of health insurance policies, from the predictable to the unknowable. And how the latter, known as “cost-sharing,” prompts those on the individual market to buy policies with high premiums, resulting in billions of dollars of additional profit for the health insurance companies. In this post, we examine that dynamic in the context of the fully-insured employer-sponsored market. 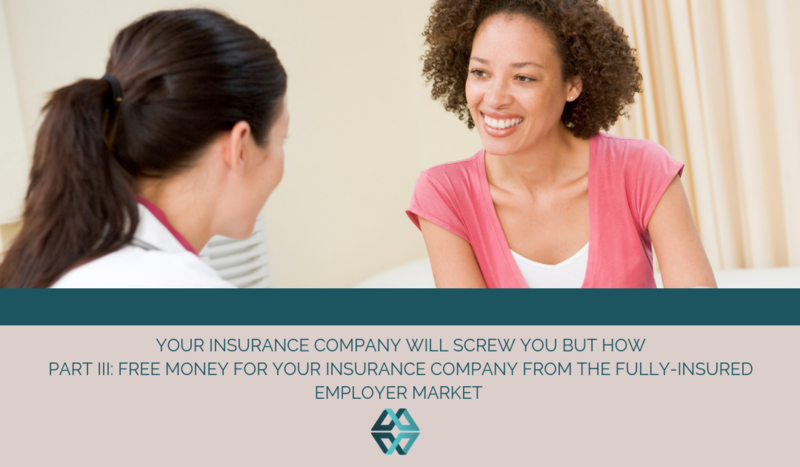 The fully-insured employer-sponsored market generally covers small businesses. This process works via a broker who offers a variety of plans, and the person in charge of benefits at the employer (who may or may not be an HR professional) selects a single plan that will cover all employees. Because the person tasked with making the choice is not likely to be a benefits specialist or have any relevant background, he or she often relies on the advice of the broker. The broker is paid a commission based on the total dollar value of the premiums. Brokers are appointed by insurance companies to sell policies for them. A broker will only show you policies from companies with which they are appointed. This means that if you are using a broker, remember the broker does not work for you; in fact, the broker has an incentive to steer you toward a more expensive policy. Employers selecting among plans offered by a small business insurance broker want to offer a benefit that employees will perceive as generous. As such, they are easily steered toward plans billed as “most popular” with low co-pays and deductibles and high premiums. This is not finger-pointing at the employer benefits decision-maker; in the same situation, any one of us likely would react similarly. An actual scenario demonstrates this dynamic in action. A small law firm in Manhattan offers coverage to its 6 employees (3 single, 3 with families). A broker offers them 18 plans from four insurance companies and guides the office manager toward a platinum plan with extremely low co-pays and no deductible. Does that make the most financial sense for the firm’s employees? Let’s compare the economics of the platinum plan to a bronze plan that allows subscribers to open a health savings account. The firm planned to pay for 50% of the premium. Let’s assume that each covered person will see a doctor five times during the year. For the bronze plan, let’s assume each doctor visit is $200. Let’s also assume that each person will set up a health savings account if they select a bronze plan. In 2018 a health savings account allows you to set aside up to $3,450/year for a single person and $6,850 for a family in pre-tax dollars to be used on uncovered medical expenses. We will assume a 30% tax rate. Both plans offer the same network of doctors, and neither cover out-of-network services. As you can see, the economics for both employer and employee favor the bronze plan. The worst-case-scenario is similar under both plans; the significant difference in premium is explained by the lower cost-share under the platinum plan. It is a question of paying for care up front that you may or may not use throughout the year, or paying as you go. Insurers and brokers would much prefer that people pay up front. Moreover, employers can make the bronze plan even more attractive to employees by funding part or all of the HSA. The employer gets the benefit of the favorable tax treatment, and employees can keep the money in their HSA and let it roll over from year to year. It can accumulate and be used as an investment vehicle. It is a straightforward way to demonstrate generosity to employees. In this case, the office manager was swayed by what the insurance broker represented as the “most popular” silver plan, which split the difference between the platinum and the bronze. Total premiums were $92,244.96, only $21,460.68 more than the bronze plan and with less perceived risk than the bronze plan. It is a defensible choice if you are an employer – which is exactly what the insurance companies are banking on. While the optics of a benefits plan can be an important consideration for employers evaluating their options prior to open enrollment, it’s all too easy to assume we know how our employees prefer to shoulder their healthcare costs. Why not let them to determine the relative value of each health plan for their unique situation? Knowledge is empowering, after all. And, while that information may not necessarily benefit the insurance company or their broker, your employees will thank you for your transparency.